After restarting the laptop, I was able to control the brightness. An alternative method is to install a PPA and brightness APP which also adjusts gamma - AWESOME!, and ... for any individual screen TOO! I had the same problem some years ago and was having the same problem again after installing ubuntu 18.04. it was a kernel problem then, and i think it may be a kernel problem now. After updating the kernel the problem was fixed for me. None of the previous instructions here didn't worked for me Then I watch this video https://www.youtube.com/watch?v=BO-kKKi_ERM and I find out that whole Rc.local file was missing. I removed all and replace new text with these.. I have Xubuntu 18 and after this brightness came up a lot, but still it's not in full mode. 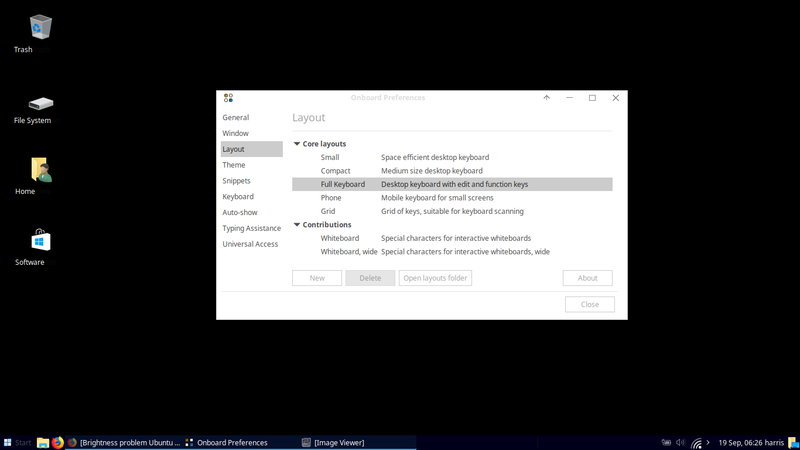 I can't adjust it with FN + right/left arrow key. It will show up but does not go anywhere. Volume adjust with up an down arrow keys works fine... weird... Xubuntu 18 seems to have bugss.. It may be related to the display driver. My issue is solved with the following steps. Dell latitude 5590 with intel VGA compatible driver. I've been struggling for the past week on trying to get Ubuntu working on my Dell XPS 15 9570 and I've had it working for a while with nomodeset but it's been killing my eyes having the display stuck on full brightness. I finally fixed it today! I updated my kernel to 4.17 (http://kernel.ubuntu.com/~kernel-ppa/mainline/v4.17/) which was last updated two days ago and then restarted, and then finally restarted again without the nomodeset option (and didn't have to replace it with anything) and the display works now!!! Remove any video options (nomodeset, video.only_lcd=0, etc.) from the GRUB_CMDLINE_LINUX_DEFAULT in /etc/default/grub file. This made it possible to adjust from the keyboard and made "night mode" actually change screen colors. I have finally found the solution to the problem. There display drivers for Ubuntu did not work out of the box for me. I started fresh from a 18.04.1 release and used nomodeset to boot into the live USB. Obviously, I could not set the brightness. I installed regularly and rebooted. Then I restarted the system and also added the boot parameters acpi_rev_override=5 nouveau.runpm=0. After the restart the desktop worked fine and I could change between the nvidia and intel graphics and could set my brightness. Also, updating the kernel did not solve the problem for me. Not the answer you're looking for? Browse other questions tagged display laptop brightness ubuntu-mate backlight or ask your own question. How do I adjust screen brightness when using a different environment from GNOME/Unity on Ubuntu 18.04?